If you haven’t already, please fill out our online inquiry form or contact the Admission Office at 410-531-7347. Once we receive your inquiry, we will supply you with a username and password to the secure parent portal section of our website, so you can view community-wide news, photos, videos, and additional information pertinent to our students, families, and school. Applicants for grades 5 through 11 may register for the ISEE here. Ready to apply to Glenelg Country School? We’re happy to have your interest and the opportunity to educate and inspire your child. The various steps of our application process are designed to help insure that your child will transition successfully into our school. We will email you login instructions to a secure parent portal within our website. Each parent or guardian noted on the inquiry form with an email address will receive these instructions and have access to your child’s admission page. Although not required, most parents wish to attend a Discovery Day or schedule a personal tour prior to submitting an application. For students applying to Grades 5-11, we encourage you to arrange a shadow visit day in the fall, beginning in early October. Personal tours and shadow visits can be arranged by contacting the admission office at 410-531-7347 or email admission@glenelg.org. Applicants to Kindergarten – Grade 4 are scheduled to spend a school day with us, placed in their current grade with peers, following the Saturday assessment/testing. Learn more about Discovery Days and Shadow Visits! A link to your child’s application is located on your admission page, above the checklist. An application fee of $75 ($125 for international applicants) may be paid with a credit card when the application is ready to be submitted. The application deadline for priority consideration for any available spaces in the following year is January 15; applications will be accepted on a rolling basis thereafter if space remains available. Assessing students during the admission process helps us determine how we can support your child's growth and development. Our programs are designed to meet your child where they are to help them excel academically and socially. Testing details are provided below under Student Assessment. Please refer to your child’s checklist located in your parent portal for all appropriate forms. These forms are specifically selected based upon the grade in which you are applying. These forms should be given to your child’s current school or childcare provider, if applicable, and they may be emailed, faxed, mailed or hand-delivered to the Admission Office. They are usually sent directly from the school or childcare provider. Please refer to your child’s checklist located in your parent portal for all appropriate forms. These forms are specifically selected based upon the grade to which you are applying. Forms may be emailed, faxed, mailed or hand-delivered to the Admission Office. Please refer to your child’s checklist located in your parent portal to download and print the Electronic Signature Agreement (ESA). For enrollment purposes, this document needs to be submitted with both parent signatures in its original form. If only one parent has legal custody, that one parent’s signature is sufficient, along with copies of court documentation disclosing the custodial arrangement or a copy of the birth certificate showing only one parent name. Applicants for the Little Dragons program are scheduled for a family interview to meet the Director or a teacher. Family interviews are typically held on selected Saturday mornings or during the week for spring and summer applicants. Applicants for Pre-Kindergarten will be scheduled for a Saturday playgroup session involving a small group of Pre-K candidates. Each session is led by our Pre-Kindergarten teachers and lasts approximately 90 minutes. Sessions include a variety of activities and opportunities for social interaction with the teachers and other children. An individual assessment called the Speed DIAL will also be administered at this time. Speed DIAL will take approximately 15 minutes. Applicants for Kindergarten will be scheduled to come to our school on one of the Saturdays listed below for a testing session. The session lasts approximately 45 minutes and includes the DIAL 4 assessment, a tool which helps us determine your child’s developmental readiness for Kindergarten. Applicants for first grade are scheduled to come to our school on one of the Saturdays listed below. The testing session will last approximately one hour, and students will work one-on-one with a teacher to assess reading and math achievement. Applicants for grades 2 through 4 are scheduled to come to our school on one of the Saturdays listed below for testing. The session will last approximately 2.5 hours (8:30 a.m. – 11:00 a.m.), and will include the abbreviated version of the Stanford Achievement Test, the Otis-Lennon School Ability Test, oral reading, and a writing activity. There are approximately three to five students per session. Applicants for grades 5 through 11 take the ISEE (Independent School Entrance Exam). 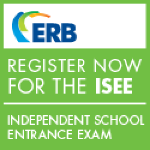 The ISEE is an admission test constructed by the ERB (Educational Records Bureau). It has three levels: a Lower Level for candidates to grades 5 and 6; a Middle Level for candidates to grades 7 and 8; and an Upper Level for candidates to grades 9 to 12. In each level, the test consists of three parts: (1) carefully constructed and standardized verbal and quantitative reasoning tests that measure capability for learning; (2) reading comprehension and mathematics achievement tests that provide specific information about strengths and weaknesses in those areas; and (3) an essay section. More information and registration materials are available through the Office of Admission at Glenelg Country School or at www.iseetest.org. Note: Candidates for Grades 6 through 11 are welcome to take the SSAT test in lieu of the ISEE; however, Glenelg Country School is not a national test site. Additionally, candidates for Grade 11 may submit PSAT results in lieu of ISEE or SSAT testing. Please note that Glenelg Country School adheres to the September 1 birth date requirement for entrance into our Early Childhood Education programs, meaning that your child’s birth date must be on or before September 1 to enroll for the appropriate grade level. Glenelg Country School admits students of any race, color, nationality or ethnic origin to all the rights, privileges, programs, and activities accorded or made available at our school. We do not discriminate on the basis of gender, race, color, religion, sexual orientation, national or ethnic origin in the administration of our education policies, admission policies, scholarship and loan programs, athletic and other school-administered programs, and the appointment of faculty and staff.